As the bell rings signalling the end of class, the doors are swung open, and students pour out of classrooms consequently congesting the hallways like the blockage of a nasal pathway during allergy season. The halls are filled with lively conversation, and noisy complaints about the newest assignments, tests, and persistent fatigue that plagues almost every student in the building. Making it through the crowded hallways of Andover High School to be on time to class can be a challenge all on its own, and with the aid of two extra legs, life doesn’t get any easier. Five minutes before the end of class, Natalie Kushner, a junior, gathers her things and stands up to leave. The steady clacking of her crutches on the floor accompanies her departure as she makes her way towards the door. For four whole weeks on crutches and two and a half weeks in a boot, Kushner has made her way to class through the crowded halls. During Kushner’s freshman year, her ankle started bothering her during cheerleading season; however, at the time, she wasn’t fazed by the pain. As the season wore on, however, the pain worsened, and a minor fracture, as well as a chipped, floating piece of bone was discovered in her ankle. A year after her first doctor’s appointment, after her sophomore year filled with cheerleading and track, she decided to have surgery to fix it permanently. As a result of her surgery, she has encountered problems like many disabled students have to face. “Navigating through the crowded halls is very difficult when there’s crowds of students rushing to get to class. Also, it was hard to find a good spot to put my crutches,” she said. 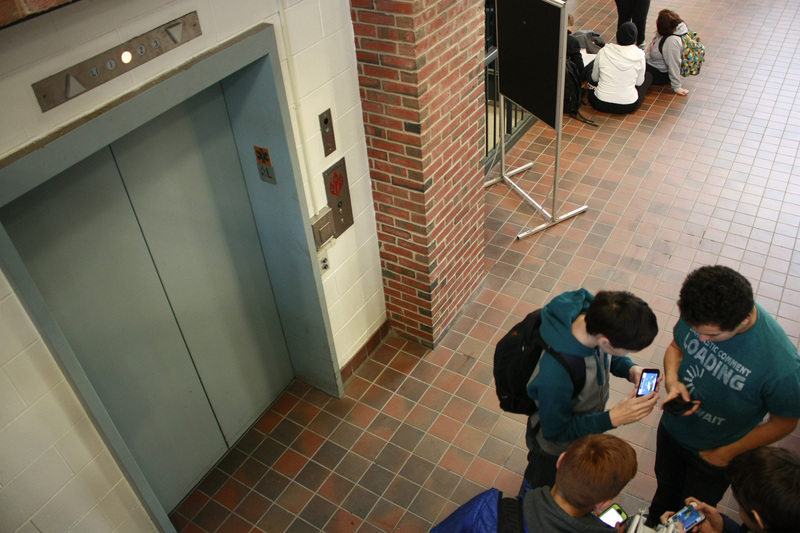 Although the elevator seems like a convenient tool for any student who does not want to encounter the mobs of students pushing each other, many students take advantage of the system, and use the elevator when they don’t have to. “Also, teachers with laptop carts, other injured students, and special education students take the elevator so sometimes there was a long wait to get on or I’d go from floor to floor letting people on and off before I got to my floor,” she said. Even though this was an unfortunate event for Kushner and reflects the difficulties that injured students have to face, it is clear that the situation was also helped with the aid of the AHS community. “Other students were extremely helpful and supportive. Students I didn’t even know offered to help me get from class to class or to help me carry my things,” she said. Not only did other students help her through the halls, but they also checked to make sure she was doing okay. “On the first few days especially, I got dozens of questions from peers asking what happened, if I needed help, and telling me they hoped I felt better … everyone was very friendly and made the experience a lot easier,” Kushner said. Being injured certainly makes the daily endeavors of an AHS student much more difficult, especially considering the struggle of maneuvering through the halls and claiming a spot in the often overpacked elevators. However, as long as students continue to be supportive of their injured peers, those such as Kushner can manage to enjoy their time at the high school despite any impairments.